Happy November 1st! Hallowe’en is officially done for another year, so it’s time to start seriously thinking about Christmas. For the next few weeks, we will be scanning the web for awesome DIY gift projects with tool requirements we can cover for you here at the St. Albert Tool Library. Christmas can be such a stressful time of year. You want to give thoughtful gifts to all those you care about, but each year the costs seem to go up and up (while quality, not so much). How often do you wind up buying something from a giant chain store and before you even have it wrapped, get that creeping feeling it will soon be just another thing sitting in a cupboard? We drive ourselves crazy and spend too much money trying to buy just the right things for people who usually just don’t need more stuff. How great would be it be to give your friends and relatives beautiful, unique gifts made by you this year? What could be more thoughtful and meaningful? With tools from our tool library, basic inexpensive materials, and some loving elbow grease, you can be the best gift-giver this year without going into deep debt to do it! From now until Christmas, you can buy a St. Albert Tool Library membership for yourself and gift one to a friend for free! This brilliant little wine rack is not only clever and unique, it is super easy to make and requires few tools or materials. You could easily make several of these in a single afternoon for every wine lover in your sphere. The one in this photo is nice, but for gifts you might put a little more effort into sanding the edges and consider a funkier finish: distressed or metallic would look amazing. This rustic wine holder has a Pottery Barn feel and though a little more time-consuming than the one above, is still quite easy to make. It has more pieces to assemble and requires countersinking some screws - but is a lovely decorative piece for your wine lover. This plan uses a pockethole jig which unfortunately SATLS does not yet have. A similar plan from Lowe's just uses a countersink drill bit or watch this video (Youtube) to see how to do angled countersink holes without a jig. I love this rack because it is simple, compact, and also holds glasses! While not at all difficult, this one is a little fussier because of the rounded ends on the glass stem slots. These will require cutting out with a jigsaw and a bit of fussy sanding to get the edges nice and smooth. (This plan also calls for a Kreg jig; see my note above). 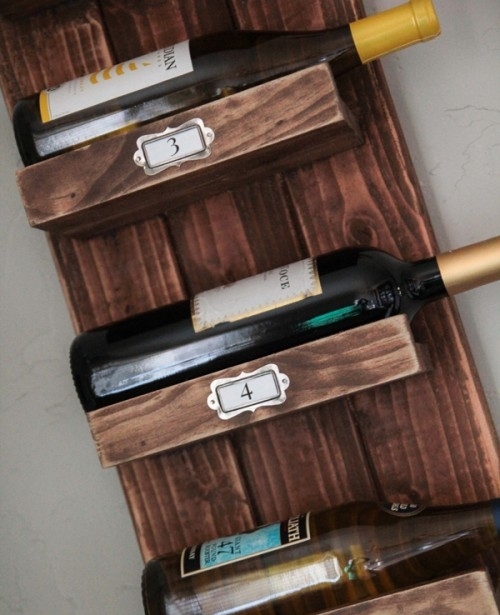 And finally, what DIY wine rack post would be complete without one made from a pallet? This one from HGTV can hold 25 bottles of wine! Alternately, the top shelf makes a great place to set a photo or two or some wine-related knick-knacks. Or maybe some tea? If you don’t see anything here that seems like just the right fit for your wine lover(s), just go to the web and search ‘DIY wine racks’ for ideas galore! Don’t forget, the St. Albert Tool Library lends out tools every Thursday night. Email ahead to info@satls.org to make sure there is someone there to help you. Newer PostMore DIY gift ideas: borrow a sander and make a fabulous chess/checkers table! Older PostLast warm weekend for yard cleaning? Tomorrow is tool library night!